Northeast China, is a good place to enjoy snow joy in winter times. Harbin, is heralded as the Ice City for its well-known beautiful ice sculpture festival in the winter. Apart from the snow joy, this tour will also provide you more about Chinese history, as well as the coastal city – Dalian. Enjoy much “snow joy” at Harbin. Learn more about Chinese history through visiting Shenyang. Explore the elegance and charms of Dalian. After breakfast, we will head to the Sun Island Park, where the Sun Island International Snow Sculpture Art EXPO is held every winter and we can see various awesome snow sculptures featuring different cultures. 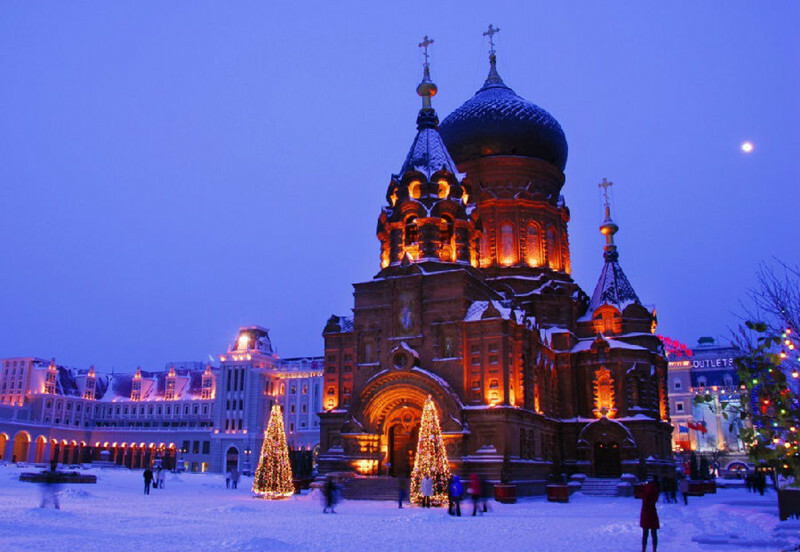 Then move on to the largest Orthodox Church in the Far East – St.Sofia Church. On route, we will pass by Guogeli Street, a Russian style walkway and bustling commercial district. About 08:00 am, we will drive about 2 hours to the Jihua Ski Resort. Enjoy skiing there (ski fee is at your own expense. Ref. CNY180/ 2 hours, CNY240/4 hours). 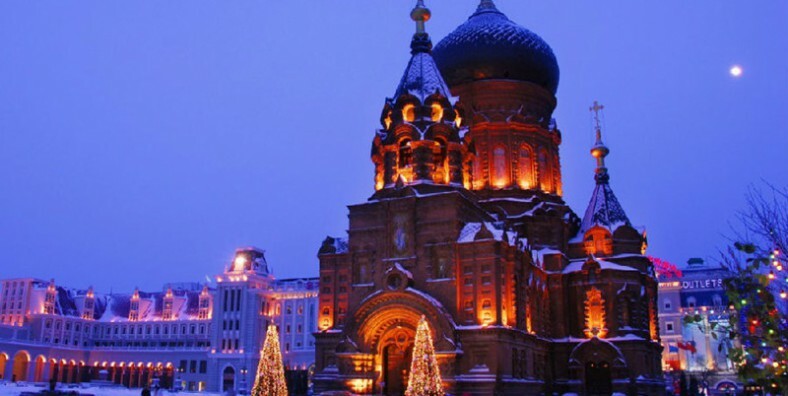 Then have walk on the Central Street to find some facts about Harbin’s history and culture. Later, visit the Ice and Snow World, an interesting site that operates each night and features illuminated full size buildings made from blocks of ice. After breakfast, we will head to visit Winter Swimming Show and Flood Control Monument. Built in 1958, Flood Control Monument is to commemorate the Harbin people in controlling the flood in 1957. Then, transferred to Changchun. Picked up by local tour guide and helped to check in hotel. In the morning, we will head to Jilin and visit Songhua River, the largest tributary of the Heilong River, which ranks the fifth longest river in China; Jilin Rime, one of China’s four natural wonders; Cotholic Church, a Gothic building completed in 1926; and Sika Deer Farm. After the visit, drive back to Changchun and visit the Culture Square, the largest urban square in the city. Today we will drive to Shenyang and visit Puppet Emperor’s Imperial Palace and The Eight Ministries of Puppet Manchuguo Regime. Puppet Emperor’s Imperial Palace is the former palace of Puyi, who is the final emperor of Qing Dynasty and the Puppet Manchurian Eight Ministries were eight administrative machineries under the control of the Puppet Manchuria, including Ministry of Public Security, Ministry of Justice, Ministry of Commerce, Ministry of Communications, Ministry of Agriculture, Ministry of Education, Ministry of Foreign Affairs and Ministry of People’s Livelihood. Today’s visit includes Sunbird Square, 12 Bronze Statues of Emperors in Qing Dynasty, and Residence of Zhangs. Sun Bird Sculpture at the Sunbird Square has become the symbol of Shenyang. Residence of Zhangs, Former Residence of Zhuang Zuolin and Zhang Xueliang, the largest and perfectly preserved former residence of celebrities in modern times. is built for people to memorize the history of Shenyang City. After the tour, drive to Dalian for overnight. The attractions we will visit for today is Lvshun Military Port, East Cockscomb Hill, and Tiger Beach Park. Tiger Beach Park is the largest ocean amusement park in China. It features a beautiful beach vista and magnificent man-made sights, including China’s largest coral museum, China’s only polar aquarium, a 4D-theater and many other amusement facilities.